We are excited to release our first blog post since the release of PDPworks 4.0! The transition to the new has gone well for most clients and we are pleased with outcome. Over the next weeks, we will be discussing different topics that are brought up to us by clients so that you can continually dig deeper into PDPworks 4.0. The first topic to review is Invitations. If you sent any invitations from PDPworks 2.3 that were not completed by November 17, 2017, you will be able to see them as "pending" in your PDPworks 4.0 account. However, those links in those emailed invitations are no longer active. 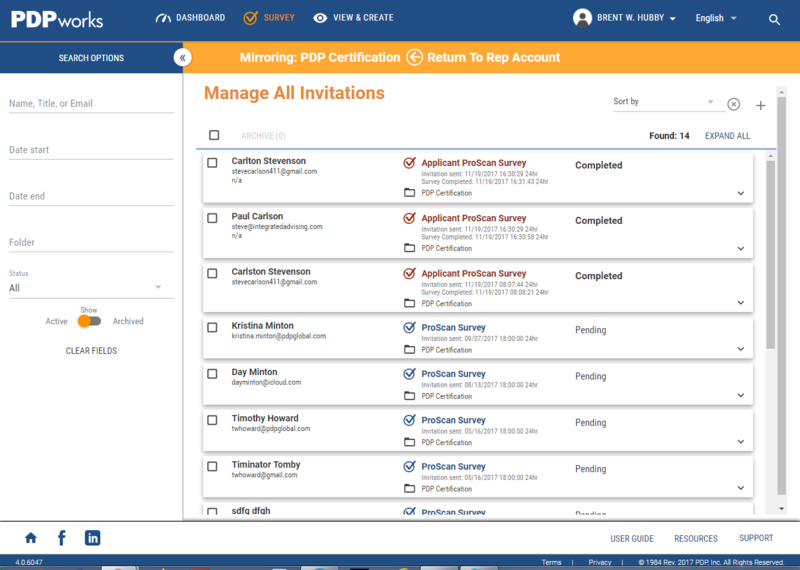 It will be important for you to archive those old invitations and create and send brand new ones to those individuals you want to take the survey. Another important note to keep in mind. You will be able to tell if an invitations is completed or pending. However, there is currently no mechanism to re-send invitation that has already been generated. This true of an invitation right now. The "resend" functionality will be added in a future update. For now, if you wish to resend an invitation, we suggest archiving the old one and generating a new one. Remember, if you have specific messages you want to send within the invitation, you can always save it as template for use later. Keep an eye out for future emails detailing more of new PDPworks 4.0!